Imagine swimming, stretching, strengthening in the sun, and then add in shopping, sipping, surfing, sleeping and sitting on a sun lounger in the shade! That’s the inaugural Swimming Women Bali swim camp. There will be a range of abilities similar to any regular swimming women session. If you are already a mermaid or a friend of a mermaid and you can swim 200m without stopping you will get loads out of this. If you can swim around the Jetty in under an hour; you too will get loads out of this. Simply put, this camp is for Swimming Women! Flights and travel insurance: You may want to arrive and depart on different days so this enables you to find a flight that suits you. All other meals and alcohol. We have taken this option as there are so many great restaurants around Canggu and surrounding areas that you can explore them at your own pace and budget. Any extra activities you may choose – surf lessons, massages, shopping. 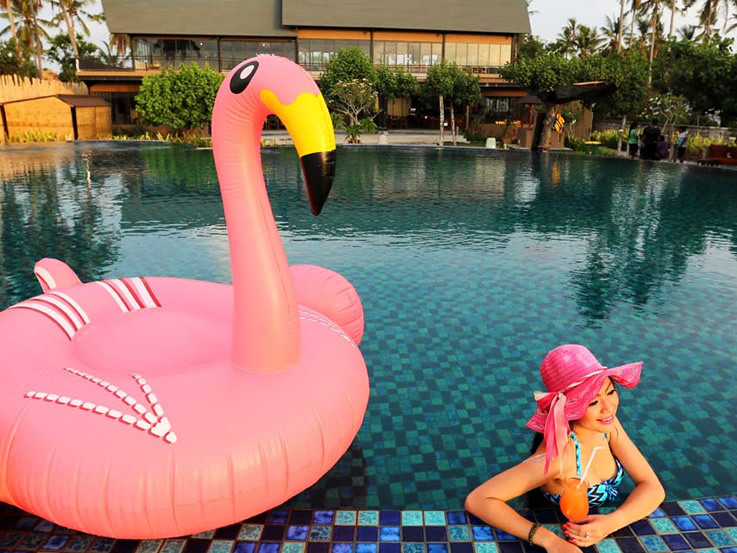 6 sessions mixing the ocean, Canggu’s open air 50m pool and the hotel pool. Video analysis of your stroke. Understand your swimming statistics and how they can help you. Challenge yourself to swim further, faster and with more finesse than ever. Stretching – lengthen, breathe and relax with two private Swimming Women Yoga Classes. Strengthening – two swim specific strengthening sessions to help you open up your chest and shoulders and strengthen your core. A final detailed itinerary will be furnished once all final bookings are confirmed but as a guide we will start each day around 9am giving you time to wake and have breakfast, as well as go for an early morning run/walk/surf if you desire. There will also be down time each day. Each pool session will have a specific focus. With a 50m pool there is so much more time and space to develop your stroke and fitness. Some days we will get to the pool twice, others we will add a fun session at the hotel pool. The final day finishes with a farewell dinner, allowing you to sleep in the following morning and depart to the airport as required. Arrive at hotel, check in from 2pm, relax. Morning: travel to Geger Beach, Ocean swimming, skills, long swim and morning tea (included). Lunch: Set amidst the rice fields at Nook Restaurant Canggu (included). Afternoon: Video analysis recording at hotel pool for all, can relax in between. PM: Optional (included) Yoga Classes at The Practice, Canggu. Pre breakfast beach fitness session. Morning: Swim Session at 50m pool. Afternoon: Tumble turns, in hotel pool. Pre breakfast Private SW group Yoga Class at the practise Canggu. 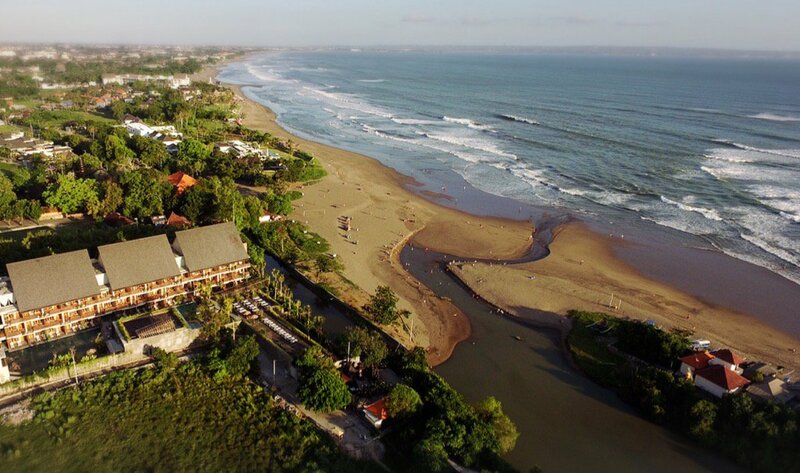 Afternoon and evening: Yours to do with as you wish: swim, relax, horse riding, surf lessons, shopping. Pre Breakfast: beach fitness session. Afternoon: Skills and games hotel pool. 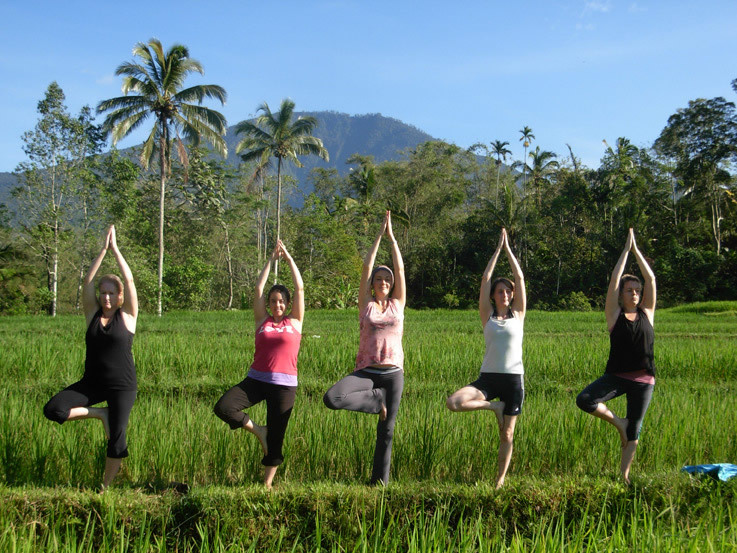 Optional any time (included cost): Yoga session of your choice at the Practise Bali. Travel home at your leisure. Check out is midday.